Pro Alarm Security Burglar alarm system Installation consists of utilizing all kinds of detector systems to protect your home, business space,the environment around it house and persons within. This kind of systems runs on an automated control system to the control panel from every point of entrance. A sample scenario exits where the magnetic switch emit the signal to control pane whenever any kind of intrusion is detected from your Gate, Doors or Windows. 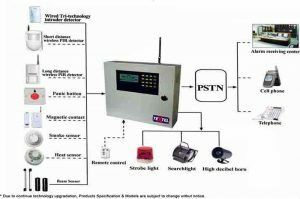 When the control panel receive alarm signal, it turns on the siren(the control panel connect siren) to scare the thief(intruder), at the same time the control panel call the Central Monitoring Station and personal telephone number that you pre-programmed, or send alarm message. Thief(Intruder) will escape immediately. Gas Detector and Smoke Detector are important for home safety, the gas detector start up the mechanical valve to cut off the gas supply when the gas leak; the smoke detector can alert you when the fire occur and reduce your loss.